Getting tired of finding a charger while your iPhone X is going out of battery? Don't worry, Euhan 4000 mAh iPhone X is easy for you. This iPhone X compatible with Apple Lightning headphones . Euhan iPhone X Battery Case provides a hassle-free charging solution on the go. Never worry that your iPhone X will run out of battery. 1.Perfect cutouts allow access to all cameras, microphones, sensors, controls. 2.Designed for iPhone X, Make your iphone special style. 3.High class material to protect your iPhone X. Charging and protection 2 in 1. 6.Charge Cable: Use your iPhone Lightning Cable to charge the battery (the cable not include). Ingenious design: The back cover battery case top cover has a magnetic function, which is more convenient and fast to use, so that your mobile phone can be quickly charged while facilitating easy removal of the mobile phone. SYNC & Portable Built-in 4000mAh, add extra 150% backup battery for iPhone X wherever you need it. Perfect for traveling, camping, business trip or other outdoor occasions. Thin and fit your hands well. Easy to carry. Upgraded design, iPhoneX Battery case top cover uses magnetic function, which is very convenient and fast to charge your mobile phone, giving you a different experience. Enjoy Music,Calling-(NOTE: please charge the battery case first before you use it to charge your iphone. 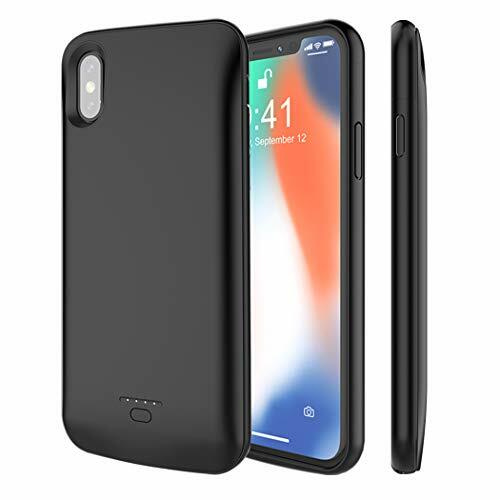 )This iPhone X battery case is compatible with iphone Lighting Headphone,which enable you to listen to music or make a phone call through the case while charging your iphone ! 4 LED POWER INDICATOR : This iPhone X /10 battery pack the features of 4 LED battery level indicator letting you know exactly the power you have (25%--50%--75%--100%); besides, you could switch on/off the battery case with the power switch button on the bottom. 【12 Months Warranty】Customer satisfaction is our #1 priority. If you are not 100% satisfied with your purchase, just let us know. we can help with any issues that you may have. If you have any questions about this product by Euhan, contact us by completing and submitting the form below. If you are looking for a specif part number, please include it with your message.